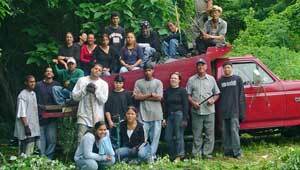 With our help, Nuestras Raíces, a grass-roots organization in Holyoke, was able to purchase this roughly four-acre parcel of land in 2004. The organization promotes economic, human and community development in Massachusetts through projects relating to food, agriculture, and the environment. This productive green space benefits the entire community, providing land for urban farmers and education and outreach opportunities for youth, who can take part in organized activities as they learn about leadership and stewardship of the river, trees and wildlife along the bank. Building on their success with the initial four-acre acquisition, Nuestras Raíces has now expanded its access to 20 additional riverfront acres, now also protected by the state's Agricultural Preservation Restriction program.